Love the way you step out in boldness with the truth. Great post. Cool! I’m re-reading A Christmas Carol as we speak 🙂 Love his style so much, always have. The time frame and settings are exactly my thing too. Excellent post! I, too, cannot get enough of the Muppets! One of the best and strongest posts you’ve written, simply timeless. Thank you!! Reblogged this on Chaos breeds Chaos. What a wonderful post about my favorite ‘Christmas-time story’ ! And how true. All of it! My absolute favorite is George C. Scott’s version, which edges a nose ahead of The Muppets’ version. Actually, Scott’s needs some adjustment: an echo chamber for Jacob Marley and leaving out the screech they give the Ghost of Christmas to Come. In the Muppet version I love how Scrooge warms and softens. It makes me choke up. Thank you for this post (as well as your other ones). Loved your reflections on this timeless classic. I can’t pick a favorite! Sharing this on my facebook page. My family reads “A Christmas Carol” aloud every year, stretching it out for 3-4 nights before the big day. Over the years, we’ve found ourselves looking forward to odd details in Dickens’ wonderful descriptions. One of our favorites is when the knocker turns to Marley’s face, and it “glowed like a bad lobster in a dark cellar”. Oh, and I just have to brag – I just bought your book from Amazon. So excited about this! I love A Christmas Carol and I agree completely that we can learn a lot from Charles Dickens’ timeless tale. A classic story seems to need to be specific enough to pull on universal threads in people, yet vague enough to leap time barriers and survive for always emerging new audiences. English/language arts teachers used to tell kids, you must read not only classic time honored literature and the Bible – even if it isn’t “your own culture” – in order to understand and appreciate the art and craft of literature/stories as well as you relationship with society and the world itself (and do well in college courses, not to mention social “small talk” at dinner parties.) A bit sad that concept is usually absent. So many reflections and conversations only on a shallow superficial pop culture level now. Well, I am not per se writing this to preach even though I am a Christian. But a good parallel would be Dune. I think you get a WHOLE new layer out of Frank Hebert’s series if you study Islam and the history of colonization in the Middle East. If you don’t there is a lot of depth you miss out on. Definitely. (Great example) A broad education/widely read habit will take anyone to a new awareness. Thanks for your insightful commentary on “Christmas Carol.” My favorite is Patrick Stewart’s classic version, which he did as a one-man show for years in Los Angeles. It’s worth noting that Dickens also used mythology from even older religions than Christianity, like Zoraster, Mithras and the story of Horus. These larger mythological themes that reach into human pre-history may be part of why this story resonates in such a deep way for all of us. That might be worth another post entirely. I just used Christianity to keep it relatively short and the themes cohesive. One of my favorite stories. I love your post for many reasons. God bless you, Kristen. I’m sharing. Absolutely without a doubt the best interpretation of this timeless classic I have ever heard! Thank you for sharing this and God bless you and your family during this Christmas season! Great post. One of the best I have read here in Blogworld. The Muppet’s Christmas Carol is also one of my favorite versions. I also like the cg version with Jim Carey. Love, redemption, a little past, some present and future, ghosts, holiday season…what could be better? Great post and analysis of a classic. A Christmas Carol is a timeless tale of redemption and has a lot to teach us as writers and humans in general. I sure enjoyed this post from Kristen Lamb. I am a lover of symbol and metaphor. Here’s a great post on even more. Charles Dickens is a master at naming characters! That’s one of my favorite parts of his stories. 🙂 As you say, “It is no great feat to love the lovely.” If you love only those who love you, what reward is there for that? Even corrupt tax collectors do that much (Matthew 5:46). Love is a powerful force; it is beauty in action. 🙂 Merry Christmas, Kristen. My favourite version too! My wife’s is the UK version with Patrick Stewart. No doubt, a great story, and your analysis is wonderful. I have watched it many times; but what has stuck with me, is the concept of timing. Marley is screwed for eternity, but if Scrooge had died first, the opposite might be true. Such fickle cause to a most profound outcome. Brilliant analysis – thank you. My daughter (who attends a Faith school – very different in the UK to the States, I believe) was studying A Christmas Carol last year. I really wish she could have read this then. But I shall certainly make sure her teachers see this blog. Thank you – I’m not normally a fan of Dickens, but I shall re-read ACC on the back on this. Thank you for showing me so many new layers to a story I’ve loved since childhood. I’m going to have to read it again with this new perspective! First of all, this may be my favorite post from you EVER. Props to you for your boldness, courage, and love in posting this. Hugs to you, sister. My Dad collected EVERY VERSION of The Christmas Carol, and I’ve seen ’em all. While the Muppet Christmas Carol is my #2, my favorite version of the story is Scrooge, the musical with Albert Finney. You just don’t get much better than “I Hate People.” Awesome stuff, right there. And I love the whole “Minister’s Cat” game and the ghost of Christmas present is my favorite in that one. It’s all kinds of YES, and it’s not Christmas until I’ve seen it. I lost all respect for political correctness when “Merry Christmas!” was banned. A great read at a time when religion is being beaten out of our society! I can’t get enough of the story either. For a matter of fact, I collect the different versions of it. My personal favorite is the 1970 musical version with Albert Finney playing the lead role. I love the songs and dance, and the casting. It offers seriousness and mystery along with humor. I had already ‘broken it down’ as to why I love the story, as do so many more. You did a much better and thorough job, with biblical explanations of things. It is a very good post/article. We all love stories of redemption, or changed hearts. That naturally blesses our hearts, or it should. God is a god of reconciliation who is in the business of redeeming hearts. The reformed churches I feel sure, see this as ‘irresistible grace in action,’ that ‘God always gets his man’ as he ‘shows mercy and grace to whom he chooses.’ Thanks for your post! I love how you break down the Christmas Story. You did it last year and I appreciate you sharing it again this year. 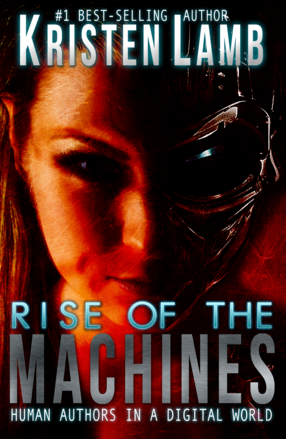 I plan to give a speech at my Toastmasters club regarding you as my favorite blogger and author (Rise of the Machines) and share how you explain the Christmas story in the Christian context. I know my audience will be intrigued. Thanks for sharing.. I probably should analyze another story but this one is just still my favorite 😀 . Thanks Kristen for an enjoyable and educational read. My favorite versions are “Scrooge” with Albert Finney and the rather dark themed dramatic version with Alastair Simm in the lead role. I think the rather dark toned version makes the redemption at the end all the more powerful. I’m o.k. with the Muppet version. My first experience with it was the first Christmas together with my new bride. It was rather strange to cuddle up on the couch with an Air Force T.I. and watch Muppets. Dear Kristen, got your book yesterday and I’m already halfway through it, I’m super hooked. You know how people are now, give them something and they’ll want more – can you recommend a good marketing book for authors? i never took that seriously, but now I’m mega interested in the subject. Thanks so much! Not really. I recommend all the books I used in ROM for research. Seth Godin is GOLD. I recommend my classes (obviously) but my way of teaching marketing seems to remain rather unique. A lot of others have adopted parts of what I teach but I think there is still too much “sales” speak. If sales speak doesn’t bother you then get 10X by Grant Cardone. I loved that book, though if you do what he recommends on Twitter I will personally kick your @$$. But the rest of the book has great advice 😀 . He is big about mega mega promotion using Twitter even if it bothers people and I don’t agree. I think it is self-centered and it ruins why we like Twitter. If everyone does this then we just stop using Twitter because it is one big spam fest. He automates and has a lot of his people tweeting prepared tweets. I am COMPLETELY against that. And I am so happy you are enjoying the book. Keep me posted! Hi Kristen, what a brilliant post. you most powerful message is one of love. This is something the world sorely needs at this time and it was the massage Jesus tried to preach during his life. If you love you can’t go wrong. He told us that we should “love one another as I have loved you” and we all need to rememeber this. On a slightly lighter note, I noticed you bit on the re-writted PC story and the fact it fell flat. This is no surprise. In stories characters are exaggerated in order to bring out their characters and Roald Dahl did this a lot with his stories. To take away this exaggeratedness (you’ll pick me up on that one I bet lol) and replace it with PC – boring! Thanks for the great post Kristen. I really enjoyed reading it as I always enjoy reading your posts. Your posts usually make me think, and this one was no different. My partner loves A Christmas Carol almost as much as you do, and I’ve watched it at least a hundred times with her. (The original as well as the George C. Scott version) Never, ever did I see what you’ve pointed out. Now I’ll be looking at my own novel-in-progress to see how I can lace it with more meaning. So thank you for once again making me think and teaching me something. Thanks very much for that post; I’ve always thought that Dickens had distilled all that is laudable about Christianity in “Christmas Carol” (or at least, a large measure of it), but coming at it from the outside of the faith I hadn’t comprehended how thorough he was. Also, a much as I like the muppets AND Michael Caine, they still can’t beat the SIm version in my books. But it’s a subjective thing. A Christmas Carol has long been my favorite holiday movie and watching the many versions we own has become a holiday tradition. Beginning with Thanksgiving evening, we watch our first Christmas movie. Yes, the Muppets version is close to my heart, and I lost track of how many times I’ve watched it, but the version we watch on Thanksgiving was made in 1938 with Reginald Owen as Scrooge. The version with my favorite Marley is with Patrick Stewart as Scrooge. And in keeping with animated takes on A Christmas Carol, I do enjoy Mr. Magoo’s Christmas Carol. They took a unique approach to the story which I enjoy quite a lot. Kristin–Thank you, thank you. I’ve read (and archived and printed) so many of your columns during the three or four years I’ve read them, and they’ve helped immeasurably, but this…this is the best. I thought I was going to learn something about the symbolism of names, but got an inspiration as well. I knew there was more…I just knew it. Have you even seen the musical, “Scrooge” from 1970? It stars a young Albert Finney as the miser. Lots of great songs in that movie as well. It should be available on DVD. Depends what source. Jacob of Genesis was a twin born second grabbing his brother’s heel, so some references translate as “usurper” or “heel-grabber.” He was the usurper who stole his brother Esau’s inheritance by tricking his father. God had quite a journey with him. When he feared for his life after tricking Esau he then ended up working for Laban. Laban outwitted him and got him for seven years of service and then pawned of Leah, then another seven years of service to give Jacob the daughter he wanted (Rachel). Anyway, it was an illustration of how God uses broken people and remakes them. Uses what is “weak” and it can be their “strength” which we as authors do all the time. That God would use a trickster and a swindler to eventually father and lead His most beloved people? Pretty amazing symbol. Actually, Esau gave up his inheritance willingly with no trickery. Jacob offered a trade and Esau accepted it. He tricked his father at the urging of his mother because Isaac was going to disobey God, but it was not Jacob’s idea. As for Laban, he was the liar and crook in the story. He did outwit Jacob, but because he was a cruel man who God blessed Jacob as recompense though Laban continually tried to cheat Jacob. It is a story of how God can take a person and fulfill his promises, like the ones He made to Abraham and Isaac. Jacob was not a trickster or a swindler, he was a man who almost got cheated out of what God promised him. I do agreed he should have trusted God instead of listening to the poor advice of his mother. It is a story of how God rescues us even when we try to take matters into our own hands. His promises will always come true. But you and I are talking the same issue (other than some sources DO translate the name to “usurper”—I didn’t make that up 😀 ). Notice I said God uses what is “weak” and it really is that person’s “strength”. Yes, God blessed Jacob to “outmaneuver” the crook Laban, but he didn’t just rain down a miracle on him. He made Jacob do the work and used his crazy intelligence and capacity for strategy (though this time positively). Also, Jacob had a capacity for trust. He had a capacity to BELIEVE he merited a great inheritance. God simply had to get Jacob’s eyes off of his mom (off people of the world) and through trial, on to God ;). God had an inheritance for him, it was just bigger than what Jacob could envision. Jacob couldn’t have the God’s eye perspective. None of us can and that in part is the great lesson of that story. And a lot of name translations have a version we go? ERR?? *brakes screech*. One version of mine is something akin to “great leader” and another is “one rubbed in oil.” O_O Especially distressing if your last name is LAMB. Great post, insights I hadn’t thought of. My personal favorite version is the one with George C. Scott as Scrooge. It was filmed in the ‘eighties, and I watch it every year. I love finding the deeper meaning in stories and hope I can do so in my own work effectively. Entertainment is fun, but I want to learn and really feel something. Thanks Kristen! I love the context you put this in! I disagree that this timeless tale relies on christianity for it’s message and archetypal attraction. The concepts it puts forth are universal and can be seen in many cultures and stories from the deep past to mondern times–see Joseph Campbell. Your biases are showing. I love the tale too as an ex-christian atheists, and comparative religions geek. Like Star Wars it hits archetypal bull’s eyes that relate directly to the human condition and psychology. Religion is the window dressing and cultural setting– the archetypes are universal. Next you’ll tell us America was founded as a Christian nation–it wasn’t. You are reading into that. I never said that. I said there are additional layers when we look at the ontological perspective of the author and it is no great secret Dickens WAS a Christian (Ie. Archetypes don’t give us the name reference of Ebenezer and the Book of Samuel). Same with Herbert’s Dune. Yes, Dune is timeless with simple Joseph Campbell treatment but if you’ve studied Islam and understand some Arabic and the unique perspective of the Middle Eastern people in regards to colonization by the Western imperial powers, it actually makes a much richer story. I don’t feel threatened by another writer’s belief system. Not even yours 😉 . I think, in trying to keep everyone happy and staying politically correct, many people have become afraid to attach meaning to anything. I love this post; it definitely makes me think of the Dickens classic in a whole new way. More than that, however, I love your straight forward, unapologetic tone. It definitely encourages me to strive for the same. Thank you, Kristen! Hey, I am not a priest and I respect all belief systems. My favorite series is Herbert’s Dune primarily because I studied Islam for my degree. Without the context of Islam, you lose SO many layers to the story. There are a lot of works that when viewed through the lens of faith (used by the author) give us a richness. We don’t have to convert to appreciate it. Even simple things. For instance, in the movie “Point Break” the antagonist’s name is Bodhi. That is short for Bodhisattva which (in Buddhism) is an enlightened being who has made a choice to help others attain enlightenment A Bodhisattva (if I recall correctly) is there to act as a mentor and a guide to aide in the evolution and working out karma so that the others may attain enlightenment as well. Without THAT knowledge, then Bodhi just sounds like a surfer name and the entire point of WHY he is robbing banks and leading a band of young men to do the same to fund this adrenalin-high life is utterly lost. Now, I do not feel threatened by Buddhism to know this extra layer. But I am happy most of you enjoyed this and no, I won’t apologize for who I am and what I believe and PC can pound sand. It has no place on my blog. That’s exactly why I loved this post and all of your writing. You’re awesome!!! This piece speaks for itself. Brava, Ms. Lamb! I am a huge devotee of Christmas Carol, and had no greater pleasure onstage than playing him a decade ago. I needed some make-up back then! Now, not so much… I applaud this critique, it’s spot-on and yet filled with things I never thought of. Truly, what a wondrous tale. I agree wholeheartedly about misers and their condition- really, all of us are in some way and that’s what the hope of Christmas is about. Never too late. But I never thought of how the Ghost of Christmas Future doesn’t speak- that’s brilliant! Dickens accomplished so much, especially to us authors it’s a testament to how your writing can do more than thrill the reader, it can even change their lives. And yet short as it is, so many of us have never actually READ it! The videos are just so good. Muppet CC is one of the very best, but I’d have to give the winning nod to Albert Finney. This Thursday I’ll republish my take! I just read the Christmas Carol for the first time this Christmas, and my grandfather used to take me to see the play. Thank you for writing about it: it was so special before, but now it means even more. I hope you had a merry Christmas! Excellent exegesis of a classic story (which, shamefully, I have never read). If it has become offensive to reference Christianity in classic literature, then I suppose no one is ever going to read a single piece of literature again? There are around 2.5 billion Christians in the world, LOL! That’s a LOT of books we’ll need to ignore. In studying languages of antiquity, I have spent a great deal of time studying the religion of Islam and Judaism, both of which are tremendously important when reading works that are inspired by said religions. The same goes for Christianity. Anyway, the works of Dickens are timeless, and I was particularly pleased to see mention of the brilliant way in which Dickens uses names to create a complexity to the character. I’m currently writing my own novel and am using a lot of what I have learnt from his example into the naming of my characters and places. My favourite names by Dickens are “Uriah Heep”, “Mr. Pumblechook”, “Thomas Gradgrind” (a brilliant one, set in the aptly-named “Hard Times”), “Mr. Micawber” and “Sir Leceister Dedlock”, who thinks that “the world might get on without hills, but would be done up without Dedlocks.” What a master of characterization and imagery!